A degenerative cause of spinal cord compression, the most common cause of cord dysfunction after 50. The onset of symptoms is usually insidious with episodic worsening. The first sign is commonly gait spasticity followed by upper extremity numbness and loss of fine motor control in the hands. For diagnosis the most valuable tool is MRI as it allows evaluation of the spinal cord along with degenerative changes. 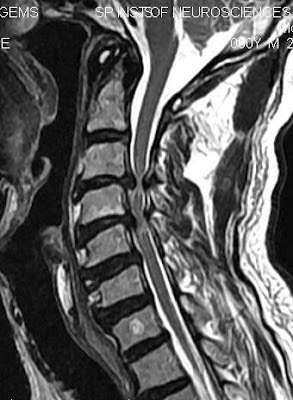 On imaging, the primary abnormality is canal stenosis, a reduced AP spinal canal diameter on Sagittal sections. Factors contributing to canal stenosis and cord changes are divided into mechanical factors and ischemia. In mechanical factors we have static and dynamic factors. Static factors include posterior disc herniation, osteophyte formation, Uncovertebral arthropathy, facet joints arthropathy and hypertrophy, Hypertrophy of the ligamentum flavum and posterior longitudinal ligaments and congenital spinal canal stenosis, which is an inherently low AP diameter of< 13 mm. Dynamic factors are the forces placed over cord during flexion and extension, the trauma to cord caused by repetitively being compressed against an osteophyte or disc during flexion and extension, a sort of friction. Ischemia is another important factor apart from mechanical compression, where degenerative processes compress blood vessels that supply cord. Spinal cord necrosis and cavitation in gray matter support an associated cord ischemia as an additional factor. Grade 3, spinal cord signal change. Surgery is superior to conservative measures. Strong evidence suggests that performing surgery relatively early is associated with better outcome. There are two surgical options. A dorsal approach by laminectomy) or a ventral approach by discectomy at one or more levels with interbody fusion. Corpectomy is an addition type of ventral approach which includes cervical plating to provide stability until fusion occurs. But at the end the choice is based on the surgeon’s preference. However, factors that guide this decision are relative location of the stenosis. If canal stenosis is primarily results from dorsal compression, dorsal approach by cervical laminectomy is better. If there is ventral disc herniations and osteophytes, laminectomy alone does not allow sufficient access to remove exact cause of compression, needs ventral decompression and fusion. Interesting. As a chiropractor, I am very much interested with these matters and it is good to know more about them. Knowing more about related studies with my field is really important to improve my practice.